A few years ago, I landed a quite temporary job working for my county’s election department. I was only required to work on election days, hence why I emphasized that this job was temporary. Each election day I worked was a twelve-and-a-half-hour shift, but I felt the job paid well enough despite that. The main reason I sometimes regretted accepting the job, however, was the fact that I dealt with some interesting situations during my shifts, to phrase that sentiment diplomatically. I know it probably seems rather odd for me to begin a review article with a seemingly unrelated portion of my own backstory, but I think I can justify doing so. I wanted to at least briefly allude to my experiences at that job because there happens to be a game which frequently reminds me of the aforementioned interesting situations I experienced while working. The game to which I’m referring is none other than Papers, Please. Within it, you are a “border agent” of sorts at a border checkpoint; which leads to the presumably somewhat dystopian nation of Arstotzka. You were assigned to this position because your name was pulled during a “labor lottery.” When I say “border agent” you might imagine something along the lines of an armed patrol agent, scouring Arstotzka’s borders and apprehending those who dare attempt to illegally enter the country. In actuality, though, all you do is sit in a booth and examine increasing amounts of paperwork given to you by people who wish to legally enter Arstotzka. I know that may sound rather boring, but as I intend to illustrate over the course of this review, Papers, Please can actually become quite intense and nerve-wracking as you progress through its story. You may recall that I recently reviewed a game by the name of Peace, Death!. 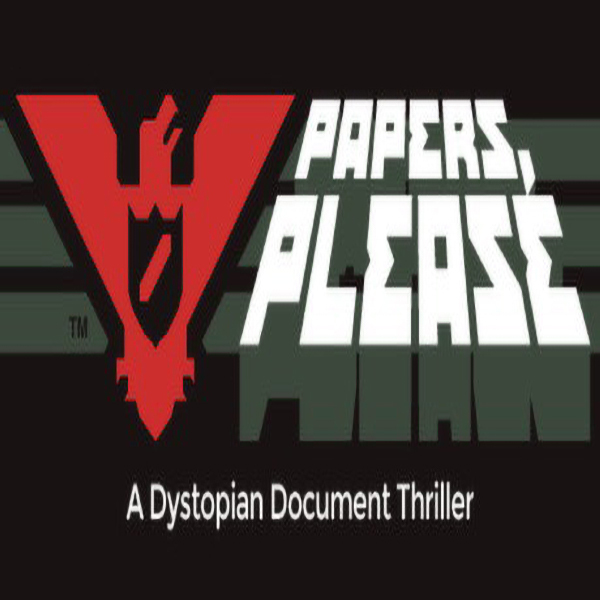 Within that review, I compared certain aspects of that title to Papers, Please on a somewhat frequent basis. That’s because, while both games certainly have their own unique aspects to them, they’re both similar in a fair few respects. One way that the two games in question are alike is that on your first workday or two within both games, you’re given a task which is simple enough to considerably lessen the possibility of mistakes on your part. This way, you can begin to become accustomed to what you’ll be tasked with as you progress. On your first day on the job within Papers, Please, you’re explicitly told to only allow Arstotzkan citizens through your border checkpoint and immediately deny entry to any foreigners. On your second day, foreigners are allowed to enter Arstotzka provided they have the necessary valid paperwork. A few days after that, you’re tasked with accurately, yet quickly, examining several more types of paperwork in addition to passports. It’s at this point, that the game’s difficulty curve begins to ramp up. One aspect of Papers, Please which doesn’t appear in Peace, Death! is the “moral choice” system, as I’ve taken to calling it. There exists a specific dichotomy in Papers, Please which I believe players should always bear in mind. In certain circumstances, you have the opportunity to either do your job exactly as you’re supposed to regardless of any potential moral consequences, or to bend (if not outright break) the rules which govern your position and risk losing your job in doing so. For example, a few days into the campaign, a man appears before you who tells you that he and his wife are fleeing from violence present within one of the countries near Arstotzka. The man’s wife is directly behind him in line, but she was unable to obtain a necessary document which would allow her to enter Arstotzka. You can choose to grant the woman entry, but you’ll be cited by the Arstotzkan Ministry of Admissions for doing so, which may result in your pay being docked. Speaking of potentially having your pay docked, there exists another unique system related to that concept within Papers, Please. You have several family members living with you in the apartment provided for you by the Arstotzkan government. Since you’re the sole source of income within your household, you’ll find that the majority of your pay has to be dedicated to paying rent, buying food, and keeping your home heated so that your family remains happy and healthy. If you don’t perform well enough at your job, you’ll be forced to make some tough decisions which may endanger your family. You’re paid five dollars for each person you correctly process through your border checkpoint during your shift. That’s the main reason why you’re expected to properly process increasing amounts of paperwork in decreasing amounts of time. If you take too long processing those who wish to enter Arstotzka, you likely won’t be paid enough to make sure your financial obligations are met.